JSC RZD Logistics will introduce its logistics services at one of Asia’s largest sectoral exhibitions – China (Shenzhen) International Logistics and Transportation Fair (CILF). The event is expected to gather at its venue 1800 exhibitors from 50 countries. CILF is to take place for the thirteen time and will be held from October 11 to October 13 in Shenzhen. 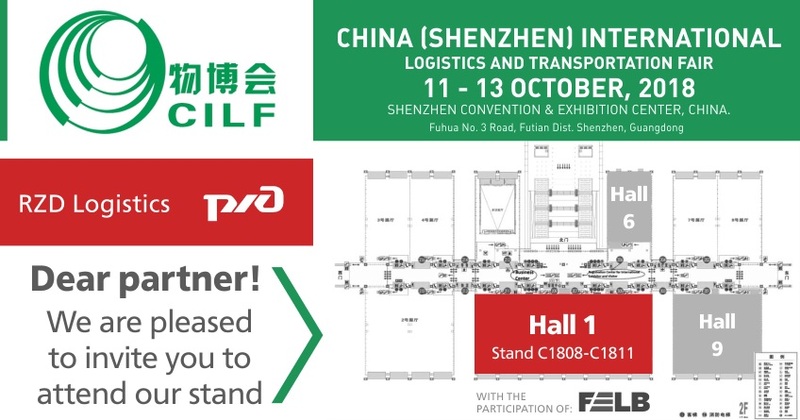 RZD Logistics will present its logistics services at a stand C1808-C1811 together with its subsidiary company Far East land Bridge. The visitors will learn about the service for non-resource railway export/import from Russia to China and in the opposite direction – Panda Land Bridge, accelerated delivery by regular container trains across the route China-Europe-China and a brand new service Rail Jet on the delivery of e-commerce goods from Beijing to Moscow and back in record time – 6 days. On October 12th, CEO of RZD Logistics Mr. Viacheslav Valentik will speak at the 3rd Sea-Rail Transport&Cross-border Transporation Summit Forum and will also participate in the panel discussion about the current transport opportunities on China-Europe-China route.